Every person upon the Earth has the ability to receive and accept healing vibrations whether it is from another human being, from an inner plane being or the universe of the Creator. To receive healing is a divine right for all souls on the Earth or the inner planes. It is also important to realise it is every person’s divine right and natural ability to express healing energies from their beings to themselves or others. This means that every person can be healed and can be the healer. When you realise your divine right and natural ability, you empower yourself. The universe of the Creator is always delivering healing frequencies to you and through you it is simply your choice as to whether you wish to receive it solely to support yourself or to share it with others in need. Many people also believe that in order to be a healer there is a need to be guided or instructed in how to express healing energies. There are many organisations which will support you in this matter upon the Earth and the inner planes; they offer an in-depth understanding while encouraging you to take responsibility for your healing ability. They may focus your awareness to certain healing energies within the universe of the Creator you can call upon to work with you. This has for some time been the accepted route to becoming a healer however at this time of ascension many people in their own time and space are becoming aware of their healing ability and the healing energies their soul wishes them to bring through. It is akin to a remembrance dawning or an activation of your divine right. The vibration of the Earth and humanity is quickening significantly causing many to remember the ir truth; their natural healing skills and alignments. Quantum physics now states that matter is merely an illusion and that everything is energy at a different frequency in vibratory motion. This is something that science has only started to take seriously since the turn of the last century. 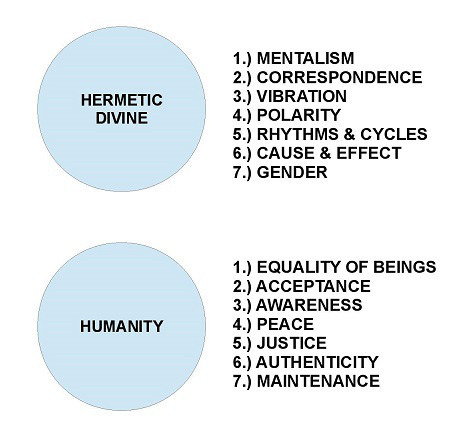 However, this was something Hermes Trismegistus (the founder of the hermetic teachings) taught as one of the 7 principles of existence and recorded history of his teachings have dated back as far as the 1st century AD. And again we are back at the wonderful “Love Poem From God” (from Twelve Sacred Voices from the East and West by Daniel Ladinsky), which explains in simple steps (steps that are reflected in the Native American Codes of Ethics) what we need to do in order to see our Golden World come true. Dear Friends, a little while ago I shared this article about the Ascended Master couple called Lord Afra and Goddess Africa, who are teaching human beings how to develop emotional intelligence, for a more authentic and truly human future on planet earth. Also I talked in the piece Native American Wisdom for the Collective Awakening Process, about the influence of the Native American Code of Ethics, on our current emotional development as human collective. And today I would like to close this holy circle of divine trinity, with the Master Hermes Trismegistus Thoth, the original transmitter of the Hermetic Laws or The Divine Principles, as they are also called. If you have not heard that name jet, he might be familiar to you as the Roman God Mercurius – or Mercury as people often say. The hermetic laws are ruling all energetic impacts in our world. 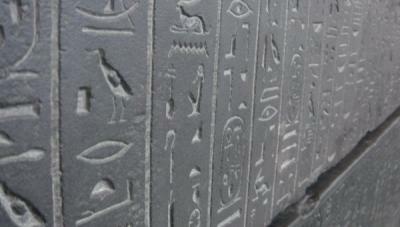 When we study them closely, we get a hint of how “the universal system” works. When we apply emotional intelligence in order to translate this mental information into feelings, we arrive at the content of the emotional field the Native American Code of Ethics should feel like in everyday life. The All is mind; the universe is mental; everything material emerges from a first though. As above, so below; as below, so above; to accomplish the miracle of unity. Everything is formed from the contemplation of unity, and all things come about from unity, by means of adaptation. Nothing rests; everything moves; everything vibrates. From existence down to matter – everything is in vibration; the higher the vibration – the higher the position in the scale. Every level of creation equals on range of vibration. Note: If you want to heal, help the world – raise your vibration!!! Everything is Dual; everything has poles; everything has its opposites; opposites are identical in nature, but different in degree; extremes meet; all truths are but half-truths; all paradoxes may be reconciled. Every Cause has its Effect; every Effect has its Cause; everything happens according to Law; Chance is but a name for Law not recognized; there are many planes of causation, but nothing escapes the Law! Gender is in everything; everything has its Masculine and Feminine Principles; Gender manifests on all planes of vibration and manifestation. That everything sprouts from the same mental essence, translates as “we are all equal”. Now in daily life on planet earth, that does not necessarily mean we have the same chances or the same blessed start in life, but it does mean we all have an equal right to live!!! This law teaches us about our constant interconnected communication with another. Of our responsibility to take care of our emotional field, so we do not effect our surrounding negatively. And it requests from us to understand, accept and integrate our divine, our human, the inner feminine and masculine energies. This is as easy as respecting and applying in daily life, authentic human rights, animal rights and even the rights of planet earth and all her manifestations, for a dignified and safe life!! But not only that, it also means to show respect for the manifestations of what we ourselves and everybody else have to bring into live, to come to our divine essence and most authentic expression. 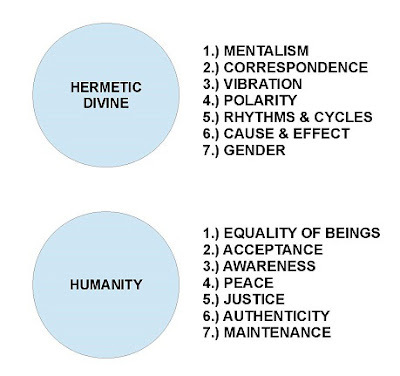 When you look at the chart above, where the divine laws are lined up, you see that the principle of polarity is in the middle of them all – and so it is inside of us human beings. 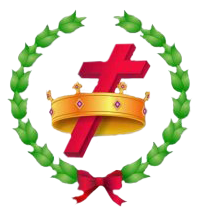 It represents the “everything connecting higher heart” in us – the only place where true lasting world peace can sprout from. This sounds like it would be a big official thing in everyday life, that the government and other big institutions took responsibility for. But in reality this principle corresponds with our ego, and the translation is about each and everyone of us!! Its about how much respect do we show for the normal everyday survival needs of every being on earth. How balanced we run our business and how careful we communicate, when we are in dispute with others. Be who you really are, express what ever the divine guidance within you demands you to bring into the world, only say what you really mean and WALK YOUR TALK!! This allows us to “emotionally get it”, that our physical bodies are masculine and feminine simply to represent the universe authentically, not to separate us from another thru stupid human concepts and ideas. And that the whole world is relationship, everything we do effects ALL of us, and that all manifestations need a seed and space to grow!!! Protection and Healing from Radiation Poisons Neurotoxins, Bacteria and Viruses. You who are reading or listening to this message are not doing so by chance, coincidence, or accident, but because you made the most compassionate and loving choice to be on Earth at this moment to assist in humanity's awakening process, a process that includes and involves every sentient being who has ever experienced life on earth! Human consciousness is an ongoing spiritual evolutionary process that you collectively chose to undergo, and to which there are no limits. Limits are boundaries that you built around the illusory environment that you inhabit as human beings but which you are free, individually, to dismantle or move beyond. More and more of you are realizing this and choosing to move through them to an awareness of the limitless possibilities that creation offers you in every moment. Those who do come to an awareness that in Truth you are completely free! As more of you open to this wondrous Truth and acknowledge it you enlarge the gaps in the field of limitations from small individual pathways to an immense and interconnected highway that all of humanity can and will use to depart the illusion. What is the Creative Mist? The Creative Mist is the subtle, powerful and wise energy of Iguassu Falls and other Sacred Places of the Mbya Guarani people. While still restricted to this site in the here and now, The Creative Mist Activity Center has been created to offer support to all those seeking Peace and the Recovery of "Word", Love and the Construction of the Yvy Pyahu – New Earth. The Creative Mist Activity Center was born to spread the news and highlight the spiritual, sacred and mutidimensional aspects of what we refer to as "The Source of the Creative Mist" or what is commonly seen as the Iguassu [River] Falls. The Creative Mist is a concept received by the Mbya Guarani Indians of the Guayrá area where the former Guayra (Falls) Source of the Creative Mists once flowed. The Iguassu Falls' Creative Mist Activity Center would be very pleased to know about all those who come here in search of the Sacred Mist aspect of the Iguassu Falls - all those who come here for ceremonies, spiritual cleansing and energy work at this Sacred Place on Earth. Documenting your existence will greatly help us in our task of bringing the public and our authorities into the awareness needed to preserve this multidimensional Peace and Power Place. Among the things we can help include putting you in contact with local travel agents, travel organizers, and other profesionals who are friendly to the idea of Iguassu Falls as a Sacred Place. If asked we can also share advice on things that are considered offensive to the Source of the Creative Mist: what to do, what not and so on. In short how to cosmoethically* visit the Iguassu Falls Source of the Creative Mist!